Boarding with Books: Review and Author Interview: Jesse's Girl! 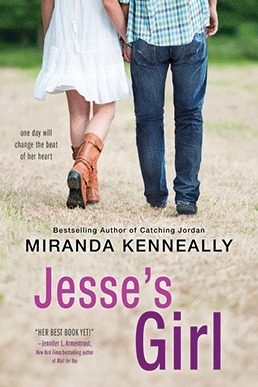 As you can tell by the sneak peek I posted way back in March, I was soooooo psyched to read Jesse's Girl. Below, an interview with Miranda Kinneally herself and my thoughts on the book! 1. First off, loving the title, and of course the song it's based on(: Did you name Jesse on purpose? How, in general, do you name your characters? A: I think it's realistic. There have been many teenagers who have become big music stars. Some of my favorites are Taylor Swift and the Jackson Five. And don't forget Britney Spears and Justin Timberlake. They were huge stars by the time they were 17. 3. You grew up in Tennessee, like Maya. How much of her story and experiences are based on yours, if at all? A: Like Maya, I was in my high school's show choir. I was a complete smart a$$ as a teenager, so I wrote down that I wanted to be a country music singer when I grew up for my school's career day. That's where I got the idea for JESSE'S GIRL. 4. Your bio lists becoming an Atlanta Brave, a country singer and a UN interpreter as dreams of yours. What inspired you to write? A: I've enjoyed writing since I was a little kid. When I got to college, I didn't do so well in my literature and writing courses, but I kept working at my writing until I got published. A: What a good idea! ;-) I will think about writing Anna's book one day after she grows up. My next book is coming out in summer 2016, and it's about a girl who gets kicked out of her private school and has to start at Hundred Oaks her senior year. So, the moment I was totally waiting for. In truth? I wasn't disappointed, exactly, but it did fall short from what I expected of it. Therefore, I recommend coming at Jesse's Girl for a good time but not high expectations. The main problem was little inconsistencies. For example, Maya says she hates country music but then talks about how she always loved Jesse Scott, aka the king of country. Jesse says he doesn't want to upset his uncle but then shows up to the shadowing day (that his uncle arranged and that Jesse agreed to so as not to upset him) wearing his underwear and being a jerk. If they were the characters' antics, you would expect that to be addressed. Also, I don't know much about country music, but I can tell you Jesse's Girl is 100% the king of cliche. Seriously, I counted. There was the usually-aggressive-pet-takes-unusual-liking-to-the-love-interest, the adults-all-leave-so-the-'kids'-can-bond, boy-throws-pebbles-at-girl's-window-to-apologize-although-he-is-not-technically-at-fault, and the classic, let's-NOT-tell-major-secret-to-other-major-character-for-no-logical-reason-whatsoever-except-further-the-plot. A.It was funny. I had some definite LOL moments. D. Country language. I'm still giggling from the 'hit the sack' phrase. I loved your review as well. Very well written. Thanks for stopping by my review as well.